Although many producers and their crop advisers are reporting average to lower numbers of NOW so far this season in almonds (based on trapping – harvest damage remains to be seen), bear in mind some of the issues that can lead to NOW build-up and damage as walnuts approach harvest. Walnut NOW damage in the 2016 harvest was relatively high. The wet winter made sanitation efforts difficult to impossible for many orchardists. 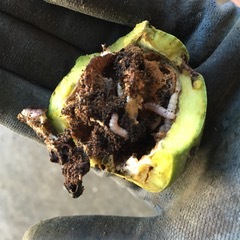 Although rainy winter conditions do contribute to NOW mortality, once orchards began to dry out, it was not difficult to find mummy nuts in trees and on the ground (both almonds and walnuts) infested with live, viable NOW larvae this spring. Reduce oviposition and development sites for the early in-season generations (prior to the crop becoming vulnerable at hull split). We had a very wet spring, which led to an overall high blight year. Codling moth populations and damage from first and second generations were high in many locations. Extreme heat in June and July resulted in increased sunburn damage. These three issues have left many damaged nuts on the orchard floor and in trees. Prior to hull split, this is where NOW can build up in your orchard, leading to a large flight when hulls split and ultimately resulting in damage to the harvestable crop. 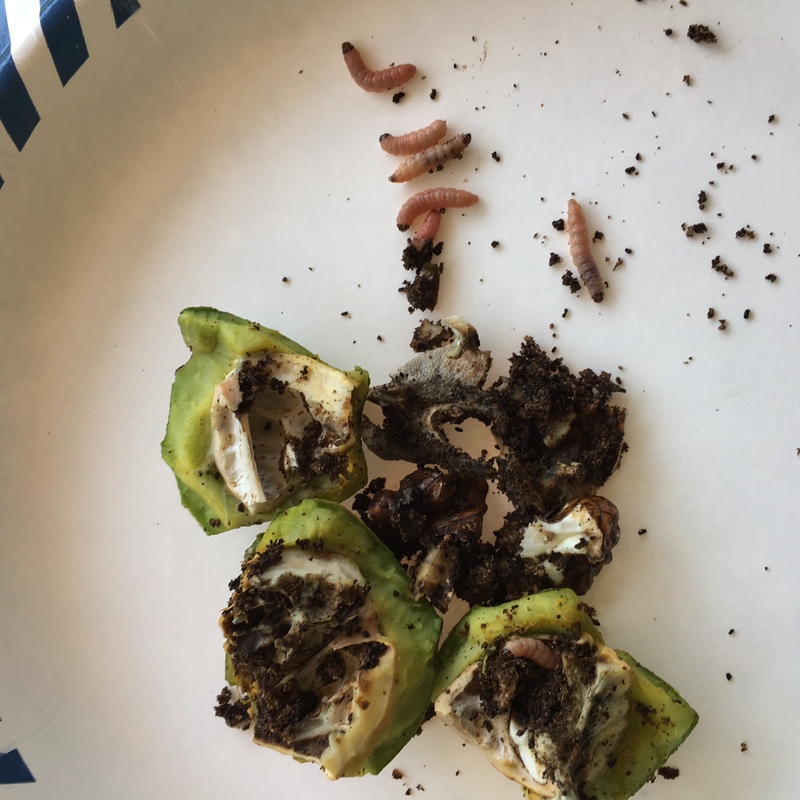 Numerous field observations over the last few weeks in walnuts (reported by myself, PCAs, and research cooperators ranging from the San Joaquin to the Sacramento Valleys) are turning up NOW eggs and larvae in damaged walnuts in a number of different orchards, both early and late varieties (Photos 1 and 2). Photo 1. NOW-infested ‘Chandler’, July 2017. Photo credit: Sara Goldman. Photo 2. NOW-infested ‘Serr’, July 2017. Photo credit: Jeannine Lowrimore. While these early-season damaged nuts will likely be blown out and not contribute to grade sheet damage, the take-home message is that they may be contributing to larger “in-house” populations of NOW that will damage the harvestable crop. The potential for uncontrollable immigration of NOW from nearby areas is always a concern late in the season, but minimizing your own infestation can go a long way in protecting the quality of your crop. What can be done at this point? Scout for NOW activity in damaged and early split nuts. Look for eggs. Note whether they are white, red, or hatched to give you an idea of how recently they were laid. Look for larvae or pupae. Noting the size/stage of the larva or whether the moth has emerged from the pupa will give you an idea of when the next adult flight period may occur. If larvae or damage is present, make sure to distinguish from codling moth. NOW larvae have the crescent shaped mark behind the head, leave behind a lot of frass and webbing, and more than one can be found developing in a single nut. Place traps in the orchard. While researchers are still determining how to use the information gained from NOW monitoring in walnuts, traps to track female activity may be valuable (but are not always reliable when pressure is moderate to low, or when competing food sources, such as damaged or split nuts are present in the orchard, as these are particularly attractive to females). Egg traps are used to track oviposition (egg-laying) activity, and Peterson (bait-bag) traps catch mostly gravid (egg-laying) females. Both can be used to indicate whether female moths are likely to be laying eggs in your orchard. Pheromone traps (which track adult male flight patterns) can give you an idea of when peak flight activity is occurring (and, coupled with the information above, when the next flight may be expected). Consider treating your orchard if you are finding NOW in previously-damaged nuts, early splits, at hull split, or if trapping indicates that the next flight(s) may coincide with peak susceptibility (hull split). There are a number of materials to choose from – consult with your crop adviser to discuss options and considerations (such as need to treat, residual activity of the material, and pre-harvest interval). Note: This post is not meant to be alarmist and suggest that widespread NOW treatment will be necessary in walnut. Every orchard and situation is different and should be treated accordingly. In future years with considerable mummy carry-over and high blight and codling moth damage early in the season, cultural practices in late spring or early summer to destroy or remove damaged nuts (and any remaining mummies) may prove valuable for reducing “in-house” build-up of NOW.